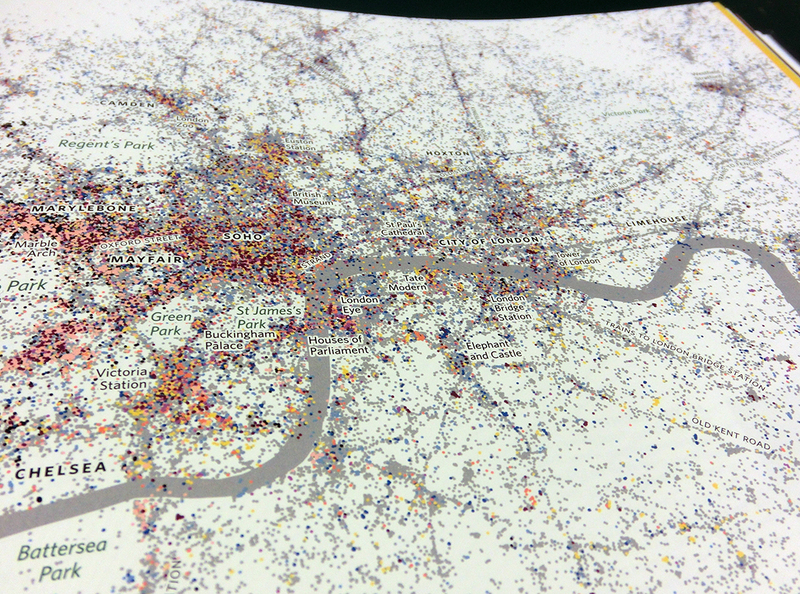 I had the pleasure of meeting two men who spend much of their time making maps from London’s data. Oliver O’Brien is an expert in web mapping and the lead author of the Mapping London blog. 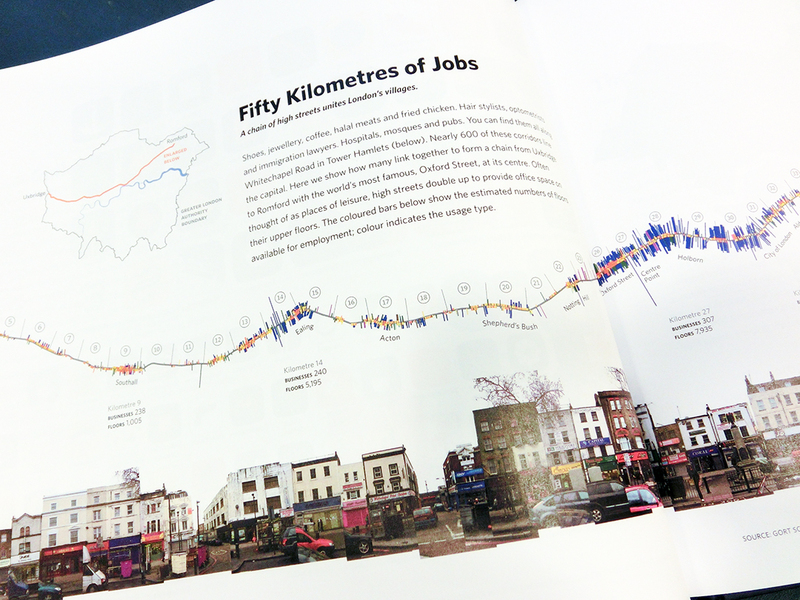 James Cheshire co-authored London: the Information Capital with Los Angeles based designer Oliver Uberti. 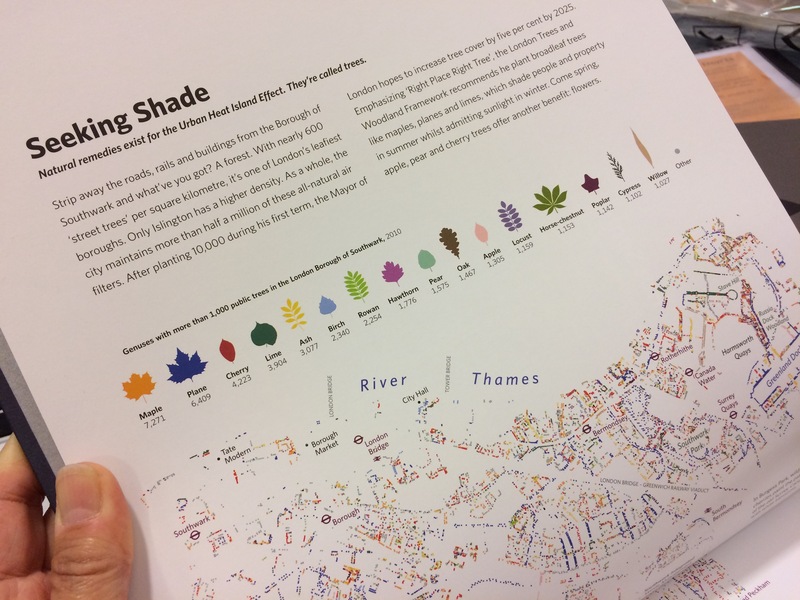 It’s a wonderfully designed book of original maps and charts that visualize several facets of London life. I’d heard about their work through Patrick Rickles when we met at the RGS Conference in early September. He happens to sit near Oliver O. and was so kind to set up this meeting in James’ office in the UCL Department of Geography. It was a great meeting. We discussed many things, such as paper vs. digital maps, the maps in Time Out London, illustrative maps, Cornell’s e-Bird citizen science project and how the removal of the Thames from the Tube map a few years ago caused a backlash (it was put back after public protest). Working in the field came up. If you want to work with data and/or maps, you’ll need to learn the standard software to present your ideas. Of course we discussed the process of map making and the reliability of data, and how when presented it should tell a story. Data can sometimes reveal too much and they explained how they protect the people/public who supply the initial information by only allowing so much entry, or zoom, into the visuals, so specific addresses are not exposed. Sometimes, if you are the only one on a block that is using Twitter, then obviously that little dot on your street is you. In this case, entire swaths of land may be generalized for presentation, so no one household will stand out. 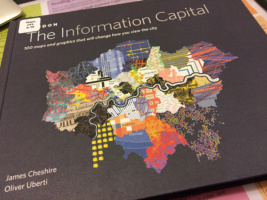 After our meeting, I made it my mission to really read and look at London: The Information Capital, as I have the time. Since purchasing a book like this is out of the question for a year’s travel, I sat in the British Library and read almost every page (I admit, I did skip a few spreads.) I loved the entire thing, but here I’d like to discuss just few things I saw in it. 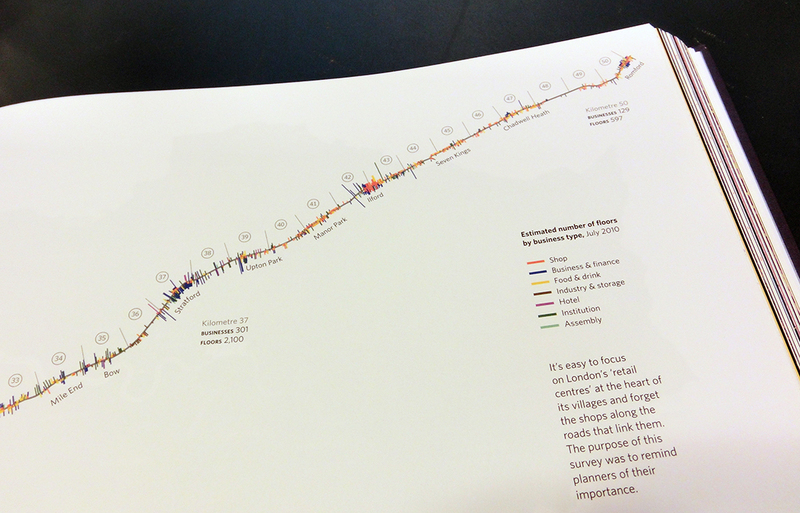 Pouring over a book like this is a lesson in information design. What’s fun about this book is that each spread is like a little puzzle. At first glance, the beauty and simplicity of the design is what draws you in – how did they make so much data look so friendly? Then you want to know what each line or dot means. If you spend enough time on one spread, you can dissect the information. Sure, there is a key with each map, but it doesn’t tell the whole story. I imagine the information distilled on each spread could be expanded to several pages of explanation. Let’s do a little detective work to understand the data and learn something about information design. This map is of one continuous stretch of streets, 50 kilometers long from one neighborhood, Uxbridge, in west London to a far reaching one in the east end, Romford. This is not one street. Here in London, a stretch like this is a collection of streets with several names as it winds through the city (which is another kind of mapping/wayfinding nightmare). I think the first thing that draws me in is the colorful line the zigs and zags across the page. Tiny straight lines jut from either side of thicker gray line that indicates the street. The key tells us what the colors stand for – dark blue for business and finance, yellow for food and drink (think pub). Orange clusters could mean good shopping! The height of the line indicates the number of floors allocated to a business, in turns tells us something about the height of that particular building. For instance in Ealing, if you look at Google Street View, you’ll see there is one pretty tall building in that high street area, on the same side of the street as the tallest line on the graphic. It’s easy to see where the clusters of businesses are. If I go to Acton, I may see a typical low key high street like the one pictured, David Hockney style, at the bottom of the spread. If I head toward Oxford Street, I’ll be waiting in line for lunch with all those office workers. Of course you can’t get all the information by looking at little color lines protruding from a gray line. Other information on the page completes the story. A diagram of the London city boundary shows which road(s) is featured. That small diagram gives you a good idea of just how long this stretch is. And the ever important “distinctive meander” of the Thames orients you further. All of these attributes work together to provide you with a good story of the ebb and flow of the London high streets. We discussed the reliability of the how the data is presented – assuming the data is accurate, as I’m sure it is for the time it was collected. How can you be sure it is being interpreted accurately or appropriately? Like the all of the paintings in Bushwick, Peckham, MoMA or the Tate Modern, all of the public sculptures of men or women on horse back AND the photos on your smart phone, visual data is presented with a point of view no matter how neutral the designer tries to make it. Even a simple spread sheet of said data can have a point of view simply by changing a font or the white space on either side of a column. Since I’ve been in London, I’ve been learning about the neighborhood where I am staying. This helps in the study of maps – where do you start? Start with where you are, or have been. It’s easier for me to digest the information if I can compare it to something that I know, even if my experience is bias. I’m in a place between Camberwell, Kennington and Walworth in South London. This is an ethically diverse area comprised of families, working class and professionals and students. Across the street from our flat is a Baptist Church. Down the street, in both directions, are traditional pubs (I can never figure out what hours they are open). Tower blocks on my corner are my neighborhood landmark. Further up toward Oval is an upscale gastropub. Down in Camberwell, you’ve got kababs and fried chicken next to gourmet pizza and a gazillion fancy coffee places. Walworth Road has an Iceland grocery and lots of thrift stores and small shops, along with a few of the typical high street shops. Let’s say it’s pretty mixed (and fabulous, if I may say so myself). Ok, so let’s have some fun and look at a couple of maps from the book to learn more about my neighborhood. 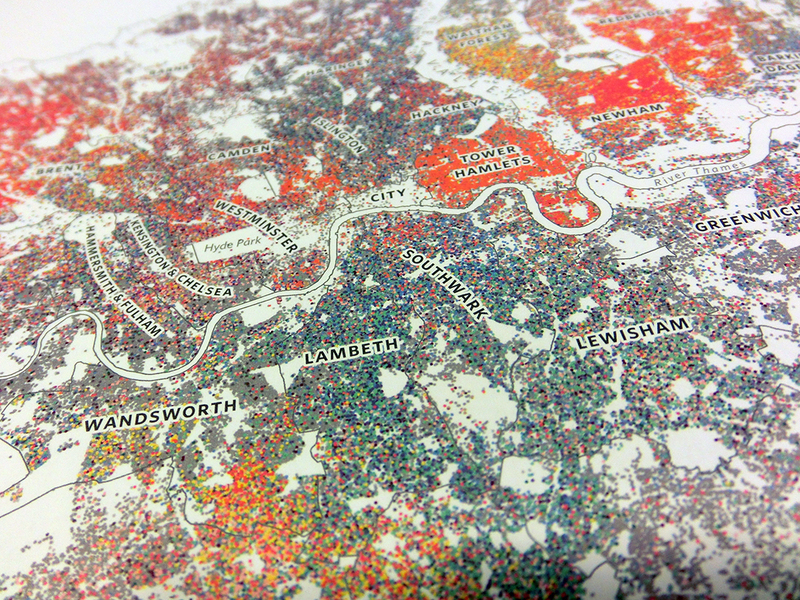 Of course there is a map that depicts the ethnicity of all of London. 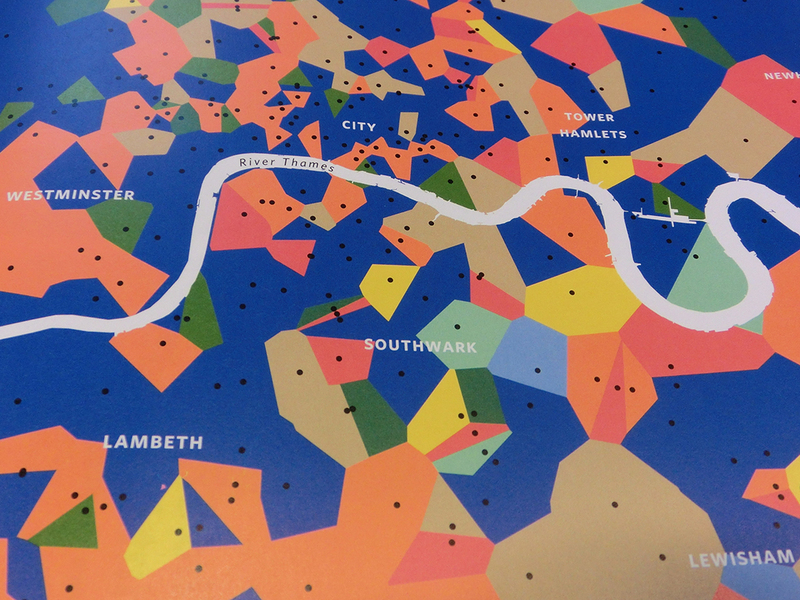 In my area which is the border of Southwark and Lambeth, the dots are mainly greens, blues, dark purples and grays. My neighbors are African, Caribbean, Mixed White +African or +Caribbean and some “other” of various types. This fits with what I observe on the street. If you look at these two maps simultaneously, you’ll see that in my mostly African/Caribbean neighborhood, first, there aren’t that many people obsessed with Twitter and second, those who are tweeting are not tourists. Since there are a fair amount of students near here, I thought there would be more twitter activity. There is quite a bit of blank area. Those who do tweet are from the UK, even though they may be of African or Caribbean descent. This comparison does not tell you why they aren’t tweeting though. Maybe they don’t have unlimited cell phone data, or perhaps their social circle does not include tweeters! I’m a fan of grocery stores and London has some pretty nice ones. You don’t really need a map to understand what grocery stores say about a neighborhood. In my estimation, the rank is such: Waitrose is the most posh, then Sainsbury’s, Coop, Tesco (For me Tesco is a tie with Coop, but Coop has better graphics.) Morrison’s, Iceland, Lidl (again, here the information is skewed, as I have never been in a Lidl). Aldi and Asda are not on my radar. Blue is Tesco, according to this map, it’s everywhere, poor, rich, everywhere. Coop would be next. Sainsbury’s is making inroads in this area, although I hear they are having financial trouble, and Waitrose, the gold standard is worth a quick side trip for me during the day. (I just noticed M&S Simply Food is not on the list!) The border between Lambeth and Southwark is Tesco Land, although, there is a Coop that is closer to me. We do have our Icelands, on Walworth Road, with none to be had immediately north of the Thames. You have to go further east or west up there to find an Iceland. I suspect that sliver of Waitrose green is a Little Waitrose, not a full blown store. So my neighbors will be shopping at the lower end grocery stores, they don’t tweet much and we use mostly the bus to get around, unless you want to walk to the tube at Oval, my closest station, about 10-15 minute walk from here. Which brings me to life expectancy shown by Tube stops – huh? I can’t imagine if I lived near Elephant and Castle, I may be alive 6 years longer. Elephant and Castle is a congested, crazy roundabout with cars, trucks and buses circling all day long, flanked by a forest of towering construction cranes. I think to compare tube stops to life expectancy is an odd combination, but it illustrates clearly how you choose to present data can muddy the information. The most clear thing about this map is that if you live north of the Thames, you’ll live several years longer…. perhaps because of all those tweets the tourists send. Thanks again to James, Oliver and Patrick for their time! Each has their own blog as well, http://spatial.ly/ and SupraGeography http://oobrien.com/, respectively. The featured image at the top of this page depicts the mental map a London cabbie must memorize for The Knowledge. This one below is a favorite of mine. Self explanatory. All photos are from London: The Information Capital and were taken by me, with an iPhone 5 in the British Library Map Reading Room, which does not have the best lighting for photography. 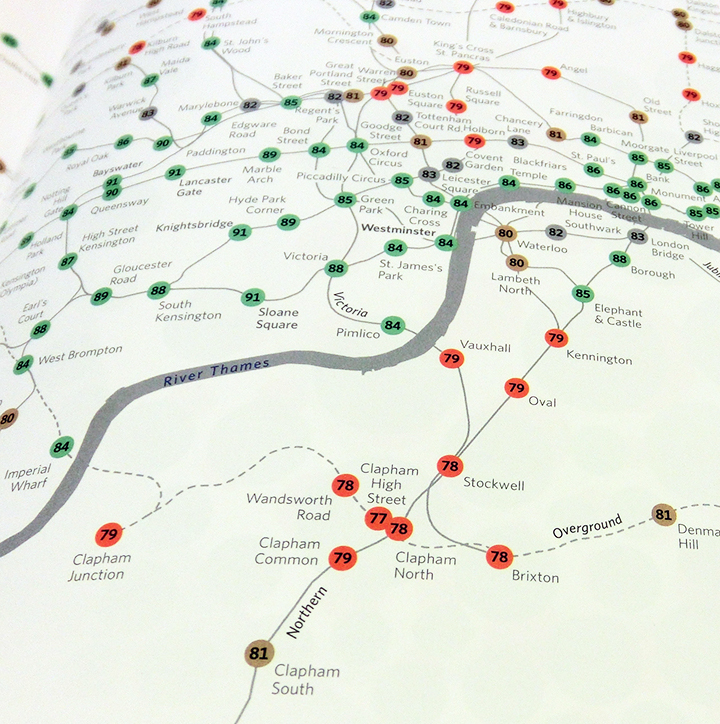 Previous Post AAA TripTiks-Long Live Paper Maps! Tagsbook data London people research wow!